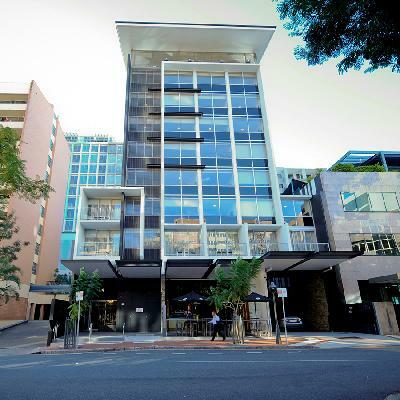 The Mantra Terrace Hotel in Brisbane is a stylish, boutique hotel that is ideally situated in the heart of the Brisbane CBD. It provides travellers with convenient access to Brisbane's business district, its medical precinct, CBD shopping, theatres and nightlife entertainment. The Mantra Terrace Hotel Brisbane is making its mark as the modern alternative to traditional hotel chains and has been specifically designed to provide relaxed accommodation without compromising style or service. The Mantra Terrace Hotel Brisbane is the ideal place to stay whether you are in town for business, leisure or a little bit of both. Having convenient access to all of the major businesses and tourist attractions in Brisbane the Mantra Terrace Hotel Brisbane is a great place for your next holiday or business accommodation. It also features numerous guest services and facilites including lounge bar, direct internet access, disabled facilities, faxing facilities, lift, massage, restaurant, room service, tour desk, airport shuttle, 24 hour reception and daily housekeeping. The Central Railway Station is only a short distance from this hotel, providing easy acces to the Brisbane Convention and Exhibition Centre, Queensland Performing Arts Centre, Southbank, Brisbane Entertainment Centre, Suncorp Stadium, Queensland Tennis Centre and the Airtrain to and from the airport. Executive King Hotel Room : Sleeps up to 2 guests on 1 King Bed or 2 King Single Beds. King Hotel Room : Sleeps up to 2 guests on 1 King Bed. Superior King Hotel Suite : Sleeps up to 3 guests on 1 King Bed & 1 Double Sofa Bed.